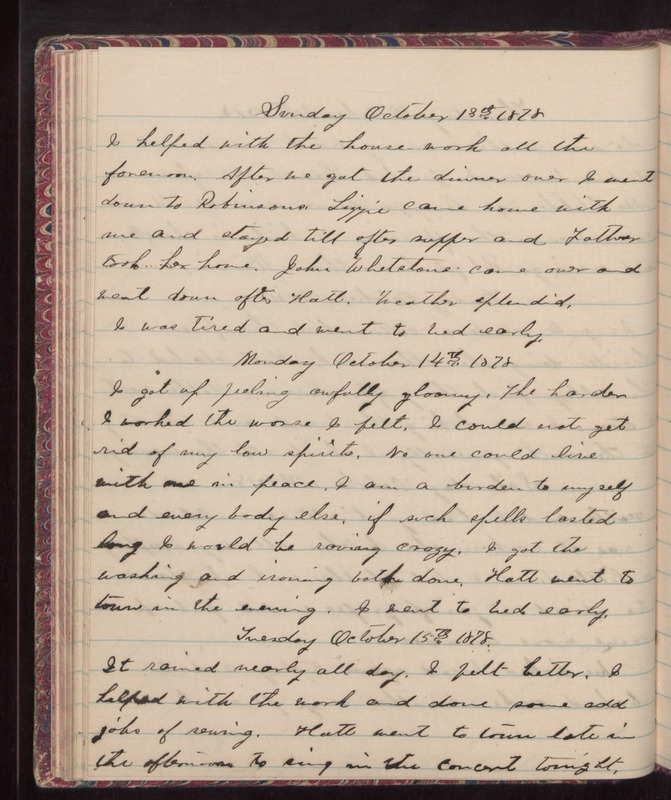 Sunday October 18th 1878 I helped with the house work all the forenoon. After we got the dinner over I went down to Robinsons. Lizzie came home with me and stayed till after supper and Father took her home. John Whetstone came over and went down after Matt. [Weather?] often did, I was tired and went to bed early. Monday October 14th, 1878 I got up feeling awfully gloomy. The harder I worked the worse I felt. I could not get rid of my low spirits. No one could live with me in peace. I am a burden to myself and everybody else, if such spells lasted long I would be raving crazy. I got the washing and ironing both done. Matt went to town in the evening. I went to bed early. Tuesday October 15th 1878 It rained nearly all day. I felt better. I helped with the word and done some odd jobs of sewing. Matt went to town late in the afternoon to sing in the concert tonight.